Preheat the oven to 180°C, gas mark 4. Grease and line the base and sides of a round 23cm loose-based or springform cake tin with non-stick baking parchment. Grind half the toasted pine nuts in a food processor or blender, then mix in a bowl with all but 25g of the whole pine nuts. Add the flour, baking powder and sugar, and combine. Mix together 100g of the honey, the soured cream, oil, lemon zest and beaten eggs, and add to the bowl. Stir until well mixed, then pour the mixture into the tin. Arrange the apricots over the surface with half the cut sides facing up, and half down. Bake for about 1 hour or until risen and just firm. Mix together the remaining honey and lemon juice, and drizzle over the warm cake. 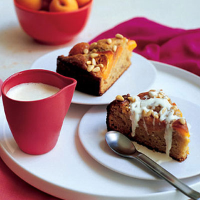 Scatter with the reserved pine nuts and serve warm or cold with pouring cream. With sweet treats, try Ceylon or Darjeeling tea. Both work well as iced teas – make as usual, cool and pour over lots of ice. Add a little sugar to taste.